This anthology is not quite as good as the original. Don’t get me wrong, some of these short stories are great, but some fall flat. Brian James Freeman did an excellent job of editing and arranging the five tales. The cover is beautiful, isn’t it? I think it fits the theme perfectly. Halloween is upon us. The first story is Mr. Dark’s Carnival by Glen Hirshberg. Halloween in Clarkson, Montana is much more than an annual event. David is a history professer who teaches folklore at the local college. His preferred folk tale is Mr. Dark’s Carnival. Although, David doesn’t know anyone who’s personally been to the carnival doesn’t mean it’s not out there waiting for you. Rumor has it that the enigmatic carnival appears out in the middle of nowhere every year on Halloween. This is David’s lucky year; his ticket gets punched. He’s finally going to find out if the legend is true. Isn’t that intriguing AF? The Facts in the Case of My Sister by Lee Thomas is a subtle tale containing consequential magic. David’s estranged sister, Joyce, is in the hospital due to an “accident”. The past comes hurdling to the present, destroying all of David’s preconceived notions. You kind of know where the story is going, but the ending is still gut-wrenching. It wasn’t Halloween–ish at all, though. Mischief Night by Holly Newstein is about a prank gone wrong. It’s set on the night before Halloween. The assistant principal, Mr. Worrall, is celebrating his retirement with a bottle of the good stuff. A group of boys decide to prank him… and that’s when things go terribly wrong. The Ghost Maker by Del James is about a disreputable hitman attending a Halloween party. Weakest story in the book. The Pumpkin Boy by Al Sarrantonio brings the October magic. The tale is set in Sarrantonio’s Orangefield. With the Pumpkin Boy, Sarrantonio brings the tricks and the treats. Children go missing. The Pumpkin Boy is linked to the disappearances. Detective Len Schneider discovers far worst than missing children. I will definitely have to read Sarrantonio’s Orangefield books. Overall, this collection was good. Some stories are better than others. I read this anthology in a few sittings. 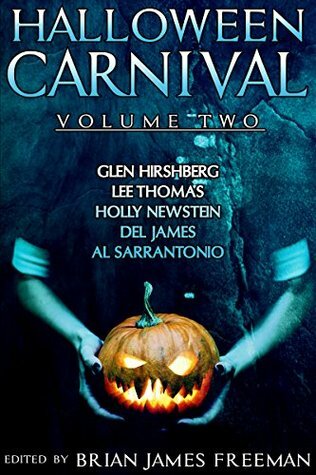 HALLOWEEN CARNIVAL: VOLUME TWO has some memorable stories, but it also has some duds that fell flat. If you are looking for a good read during the Halloween season, then this anthology series will suffice. I look forward to reading the third volume in this series.